Why is Intermarriage Important ? Having worked on a couple of reports about intermarriage in the U.S., I get this question often: Why do we care about who marries whom? “Intermarriage” refers to unions between people of different races or ethnicities. To many sociologists, racial and ethnic intermarriage is a barometer of racial/ethnic relations in America. Partners in a marriage accept each other as equals, and their friends/families also get a chance to mingle. Marriages across racial and ethnic lines therefore help to break down social barriers between groups. Intermarriages could also change the definition of race in this country, as more children identify themselves as multiple races . We are becoming “a nation of mutts”, as David Brooks wrote recently. For most of this nation’s history, a majority of states had anti-miscegenation laws that made it illegal for whites and nonwhites to marry. The first such laws were passed in the 1600s to prevent freed Black slaves from marrying Whites, as well as biracial children of white slave owners and African slaves from inheriting property. As Asian Immigrants came to the U.S. in the 1700s and 1800s, anti-miscegenation laws were passed to prohibit Asians from marrying Whites. The effects of these laws were far-reaching. For example, earlier Chinese immigrants were mostly young single men. They were not allowed to bring women from their country to the U.S. (if they got married). Many of them returned to China, and those who stayed rarely got married and had offsprings. After World War II, many states repealed these laws. It was in 1967, during the height of the civil Rights Movement, the U.S. Supreme Court’s ruling in Loving v. Virginia declared anti-miscegenation laws that remained in 15 states unconstitutional. America is much more racially and ethnically diverse than it was five decades ago.The once-illegal intermarriage now has reached a historical high. As of 2010, the share of all current marriages that are either interracial or interethnic reached an all-time high of 8.4%, and one-in-seven new U.S. marriages was between people of different races or ethnicities. Marriages between whites and non-whites are the most common types of intermarriage, which accounts for seven-in-ten (70%) new intermarriages in 2010. 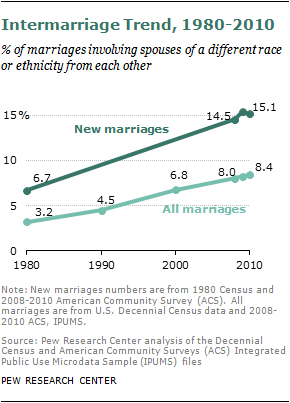 The American public is more accepting of intermarriage as well. Nearly two thirds of Americans (63%) say they would be fine with a member of their own family marrying someone of a difference race, while only one-third of the public accepted intermarriage in 1986. I will write more about intermarriage in future blog posts. Stay tuned!